Chasin' Mason: [Want, Need, Wear, Read] A Gift Guide for the Mama + a HUGE $1,000 Stitch Fix Giveaway! 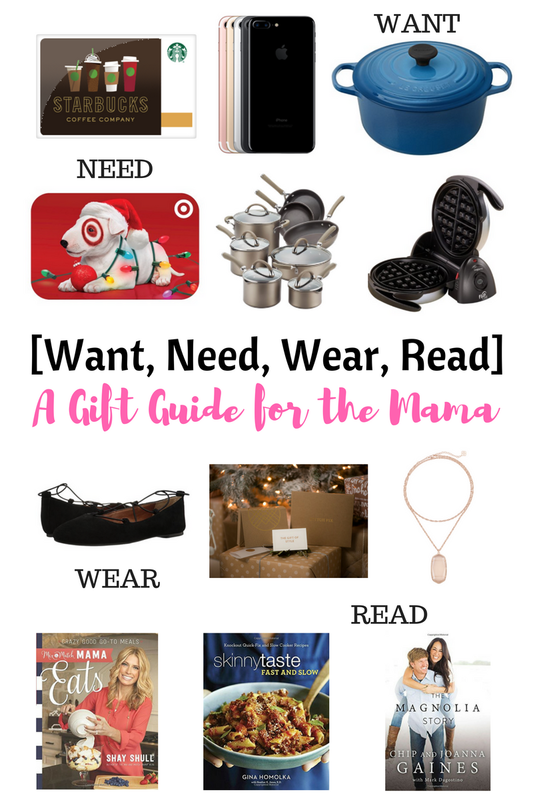 [Want, Need, Wear, Read] A Gift Guide for the Mama + a HUGE $1,000 Stitch Fix Giveaway! For some reason, I always feel like answering the question "what would ____ like for Christmas?" is the hardest to answer about myself. I literally could name off a million things that Mason wants and close to at least ten (ha!) things that Seth wants. But for me? I draw a blank. It's silly really. I mean, I should know myself the best, right? Apparently... wrong. So, I got smart this year and started a list on my phone so when people asked, I knew just what to tell them! If you follow me on Instagram, you'd know that this would be a definite winner for me for Christmas - a Starbucks gift card! Seriously, I am addicted to those Chestnut Praline Lattes. I wasn't sure after my first one, but now I'm hooked. It's going to be a sad day when the red cups and the holiday drinks are gone. As long as they don't take away my Peach Green Tea Lemonade, I'll still be a happy girl! I'd really love a dutch oven. My mother in law has one and makes the most amazing meals in it and I'd love to recreate them at home so we could have them on days other than Sunday family dinner night. They are super expensive so I guess I wouldn't consider it a need, but I really do want one. I'm just going to file this as a need - a Target gift card! I mean, what don't I need at Target? The answer is nothing - because I need everything! This would be a definite win if I found one of these in my stocking! We are in desperate need of new pots and pans. The ones we have have definitely seen better days. These ones get great reviews on Costco's website, but I'm always open to suggestions! I'm sure this should fall under the want category, but hey, everyone NEEDS waffles, right? Right. As much as Mason LOVES Eggo waffles (the blueberry kind to be exact), I'd love to have a real waffle maker to be able to make waffles on the weekends! No toaster kind for me! I've been DYING for a Kendra Scott necklace for forever but just couldn't pull the trigger and spend the money. This is kind of a cheat since I already bought it for myself (err, well TWO! Ha.) when they had a Black Friday sale last week, but I was so excited when Meghan helped me find this pendant necklace without the tassel! I mean, I love the tassel, but I feel like the tassel makes it more fancy, and well, I'm just not very fancy, so I was so happy to find out that they still sell the necklace without one! So happy in fact that with their 20% off sale, I bought two. I mean, free shipping and free returns? Why not? Ok, this is kind of a cheat too (apparently I'm bad at buying myself presents and/or waiting until Christmas! ), but I loved my brown Lucky Brand flats so much that when I saw that the black ones went on sale (on Amazon!) I had to buy them! They arrived yesterday and are pure perfection! I know these will get a lot of wear. 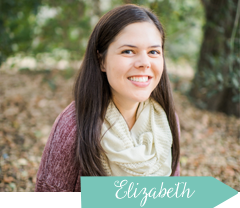 If you've read my blog for any amount of time, you probably know that I love Stitch Fix. I got a gift card for my birthday last year, ordered my first fix, and have been hooked ever since. I mean, the fact that someone can send you jeans that fit PERFECTLY blows my mind and keeps me coming back. I mean, I can't even buy myself jeans that fit this good! If you haven't tried Stitch Fix yet, I highly suggest you add a gift card to your Christmas wish list! Heck, just a $20 gift card will get you a free styling fee and then you can decide if you want to continue the service after you get your first box. (I was hooked after one box and actually JUST got my first 5/5 (!!!) after switching stylists recently. I can't wait to share that with you soon, but that's a post for another day.) Stitch Fix gift cards make excellent stocking stuffers! I'll be honest, I'm not a big reader. I don't think this comes as a surprise to most. But, I do love a good cookbook. This Mix and Match Mama Eats Cookbook or the new Skinnytaste Fast and Slow look amazing! Or, even though it would probably take me a year to read the whole thing, I'd love The Magnolia Story by Chip and Joanna Gaines! Oh! And one more thing... to go along with the wear category (and quite possibly the want and need categories too! 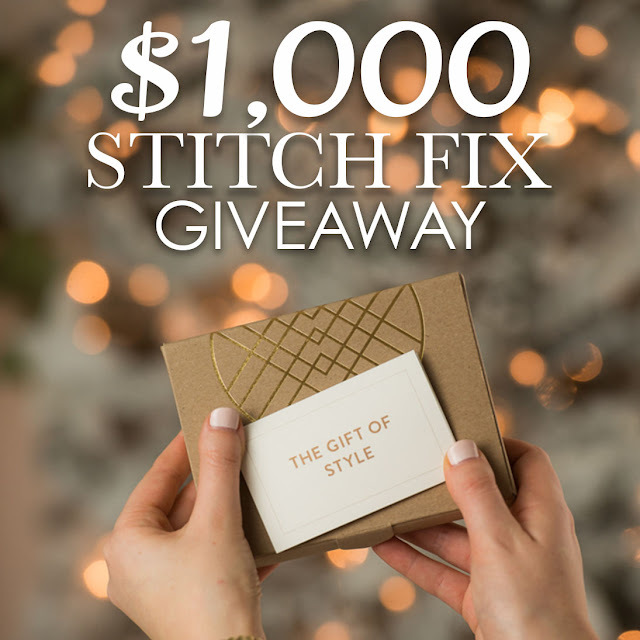 ), I'm super excited to be partnering with some other Stitch Fix bloggers to bring you one of the biggest Stitch Fix giveaways yet - a chance to win a $1000 Stitch Fix gift card! Never tried Stitch Fix before? Why wait! This is the perfect opportunity to get yourself started! Already love Stitch Fix? Then you know just how good this giveaway is! LOVE your list. I have a similar pot on my list but I am even willing to settle for a knock off! You totally need a waffle iron too! Love those lace-up shoes on you. I've always had my eye on some Kendra Scott too but have never bought any, can't wait to see you in your new necklace, it's beautiful!! Great list! The Skinny Taste cookbook is on my list too. I LOVE my Le Creuset dutch oven! You definitely need one :) I bought mine on sale at their outlet on Black Friday a few years ago. We got a great deal and it is no different from the ones they sell at Williams-Sonoma! Such a good list, I want a 7plus too!!! Such a fun list! I have a Dutch oven but rarely use it! So please do share all these amazing Dutch oven recipes! I love this list. I want the iPhone 7 Plus as well. Genius to keep a list on your phone. I need to do that because I always draw a blank. I love your list! Target and Starbucks cards are on my list every year, along with Disney, Kohls, and Michaels gift cards :) I LOVE that Kendra Scott necklace and the matching earrings, but haven't managed to snag any of them yet. Yay for getting them on sale! We also do the want, need, wear, read thing, but mostly for the kids. I think it's such a good idea! Starbucks, Target, and Stitch Fix...can't go wrong with those! I love cookbooks too. I hope Santa gets your list and fills up his bag with the whole thing! I always draw a blank for myself, too! And, I'm basically I'm copying your list to hand over to Scott. I think you should also add the new cookbook coming out by the ladies who started Sprinkles, I have that on my list and if I come up empty handed at Christmas I'm totally buying it for myself! Gift cards are always on my wishlist every year! Such great ideas! Great list. At first I thought the starbucks gift card was under need, and I was like yeah, I need starbucks too. Love the kendra scott and that blue pot, I want both too! My big ticket want item last year was a dutch oven! You know how many times I've used it? Nada. lol. But that waffle maker will see lots of action, I guarantee it! I'm so glad I could help with the necklace!!! And now I want to order the black flats too... I love the brown ones!!! I want to read the Magnolia story too! Great list! !